Mike Bauer is in his sixth season as the General Manager of Roger Dean Stadium and Jupiter Stadium LTD, after earning a promotion from Assistant GM in 2011. Bauer, who is the third GM in the stadium's nearly 12-year history, is responsible for overseeing all aspects of the 110-acre complex which is widely considered one of the busiest sports facilities in the country. 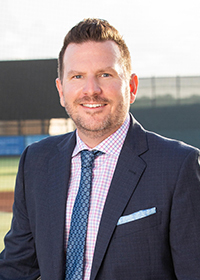 As GM of Roger Dean Stadium, Bauer is assigned the unique task of running the year-round complex that is home to six professional baseball teams, numerous tournaments and events and a wide variety of other local and nationally-based activities. Roger Dean Stadium is the only facility in the country to host both two Major League Baseball teams for Spring Training - the Miami Marlins and St. Louis Cardinals - as well as each team's Class-A Advanced level Minor League affiliate (the Jupiter Hammerheads and Palm Beach Cardinals). The complex, which includes a 7,000-person main stadium, 13 practice fields and two state-of-the-art clubhouse facilities, is also home to the Marlins and Cardinals' Gulf Coast League affiliates and is visited by more than 300,000 people every year. Prior to his promotion in 2011, Bauer served nearly a year as Assistant GM while also taking on GM duties for the Jupiter Hammerheads. He took the Assistant GM position at Roger Dean Stadium after four years as the Executive Director of Palace Baseball for the Class-A Asheville Tourists, located in Asheville, N.C., where he was responsible for overseeing all operations associated with ticket and sponsorship sales, facility management, marketing and media relations, food and beverage, merchandising and guest services. While with the Tourists, Bauer engineered three of the most profitable seasons in the organization's history, including setting attendance records in 2006 and 2008, as well as implementing numerous ballpark improvements and nationally-recognized marketing endeavors. Under his direction the Tourists achieved both their first radio and television broadcasts, hosted the first concert in stadium history and successfully completed a $2,000,000 renovation to historic McCormick Field. Bauer spent nearly six years with the Tampa Bay Lightning and St. Pete Times Forum (Now Amelie Arena) before his stint in Asheville, moving up from Suite Services Manager in 2000 to Guest Services Manager to ultimately Front of House Manager in 2003. As director, Bauer managed a staff of nearly 500 while providing guest services for such notable events as the Stanley Cup Finals, the NCAA Men's Basketball Tournament and concerts by acts including U2, Paul McCartney and the Rolling Stones. A proud two-time graduate of the University of Florida, Bauer earned a Bachelor of Arts in Management with a Minor in Mass Communications in 1998 and later acquired a Master of Exercise and Sports Sciences degree in 2000. He and his wife Stacy have two young boys, Luke and Chase, and reside in Jupiter.